1988 saw the release of “ Front By Front ” (including HeadHunter and Welcome to Paradise) which placed the band onto most of the covers of the European rock press. From now on, Front 242 is a fact. Front’s vision continued toward fuller maturity. The world drastically changed since 1991’s “ Tyranny For You“ album, and the members of the group moved with it. The two albums, “ 06:21:03:11 Up Evil “ and “05:22:09:12 OFF “ broke through the classical Front formula to bring in new vocalists, live guitars and drums. Redistributing roles and rules within the group, allowing other facets of the band’s personality to shine through. Andy Wallace (Nirvana, Sonic Youth) was called in to mix the album in Front’s studio. Exercising his talents within an electronic environment, bringing an abrasive, edgy, and seductive album to full potential. Released in 1993, the project showed the scope of radical I nvention and attitude, that goes hand in hand with Front 242’s music. Taking a two year sabbatical didn’t stop Front from moving. It enabled them to realize two attractive CD’s: “Live Code”, recorded during their last world tour, brings to the forefront the power of the group’s live performance and sound and “Mut@ge - Mix@ge”. The compilation-album “Mut@ge-Mix@ge” proposes The Prodigy, The Orb, Underworld, Rico Conning, and Front 242 all on the same record . More than a “remix” album, all the tracks, enriched by the innovative mixes of the other artists involved, and each dealing with different levels of technology, have been reedited in a specific order by Front 242 to provide a successful continuity of enveloping atmospheres and rhythms. In 1997-98, the band has decided to undertake a World Tour to underline their last releases. Playing “live” has always been a good way for them to check out excitement and creativity. In that matter, the “live” music on their last CD release “Re-Boot” includes new sounds and structures in order to present updated versions of older compositions. 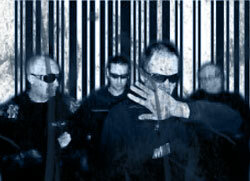 After a long absence, Front242 releasesd the EP « Still & Raw » and the Album « Pulse » . Based on an aesthetic from the 70’s and 80’s, when the roots of todays electronic music were influenced by German bands , Front242 re-invents the original sound that was at the center of their art and enriched by 20 years of experience. Analogue technologies and vintage machines pulsing into deconstructed tracks where emotion and research leads to a purely electronic attitude. Front242, an unpredictable band, surprises the old and new audiences - while continuing to make the link with today’s music... with no concessions to their integrity .